Over a period of time, lint, fibre, dust and fungus accumulate in the ducts, and blocked or contaminated ducts have a direct impact on the performance and also the Indoor Air Quality (IAQ). 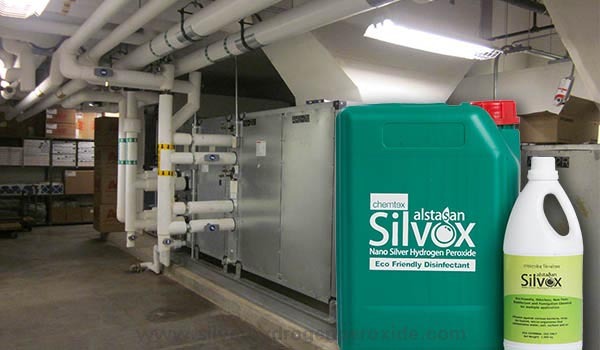 ALSTASAN SILVOX (Silver Hydrogen Peroxide based Biodegradable Disinfectant) addresses the concerned areas of AC plants without causing harmful/toxic effects. Hydrogen peroxide with silver is effective against all pathogens without altering/ compromising any quality of the residual product. This effective biocide is diluted at a given concentration and fumigated using a fogging machine to disinfect an area. Efficiently improving the Indoor Air Quality (IAQ) rendering it safe. Some common airborne diseases include flu, tuberculosis, measles, etc.